- Securely hide formulas by converting them into binary format. Without this feature any kind of Excel file copy protection is useless. 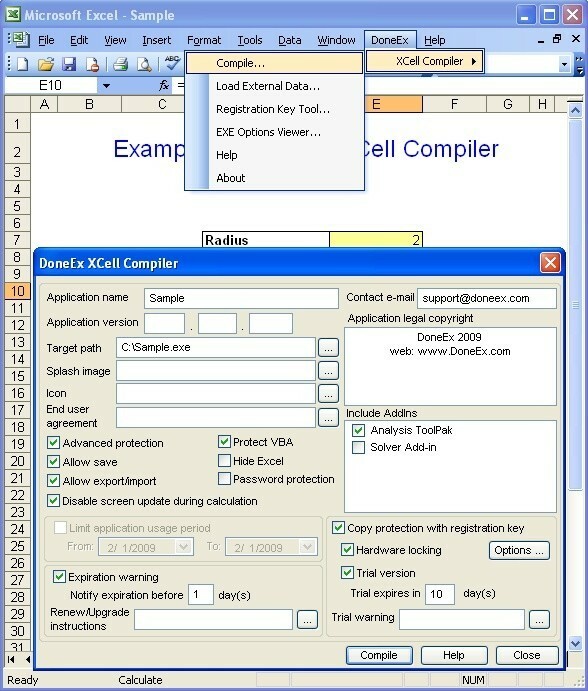 - Compile Excel Workbook (XLS file) into an application (EXE File). You do not need to be a programmer to use the product. - Create registration/license based application. Prevent illegal copying from one computer to another. - Hardware locking. Allow your compiled Excel workbook to work on target computer only. - Royalty free distribution of your compiled EXE,which doesn't require any pre-installed Run-Time libraries. - Create Trial/Demo of compiled Excel workbook limited by amount of days and nag window. Adjust your own trial/demo limitations on cell formula level. - You can add your own splash screen, while compiling. This will give you a chance to advertise your own company name.